I’m rather glad I didn’t have to ask for this wine by name. It has a heck of a name. 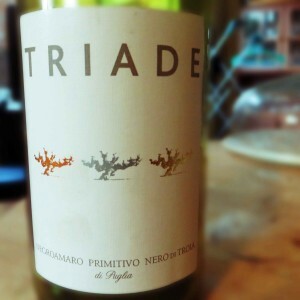 Triade is OK, I could cope with that, but it’s the triad of grape names that follow that I may not get to the end of safely if I was ordering a second glass. These are three popular Italian grapes. Primitivo is best known to our colonial cousins as Zinfandel, but Negroamaro is increasingly trendy, and delicious – although I do offer this piece of advice – never spill a glass of pure Negroamaro on your carpet, there is a clue in the name as to just how dark and deep the stain will be. Having carefully poured a glass through the aerating gizmo, without any carpet damage, this wine looked good and purple, with a deep almost opaque colour. It had good strong legs and a good strong whiff of alcohol. It smelled of fruit, but also of licorice and something that wasn’t quite coffee and wasn’t quite chocolate, maybe it was mocha. It tasted dry, with a medium acidity and a wallop of tannin, strong, firm and ripe tannin. It felt medium to full bodied with the alcohol level being at the high end of medium, not quite as heady as the first sniff had implied. The fruit was big and juicy, cherry and raspberry. The mocha mellowed into coffee. The licorice didn’t mellow into anything, it stayed throughout, adding a bit of warmth. I really enjoyed this triple whammy, I think the three grapes worked well together to give a rounded, flavoursome and robust wine, one that could easily stand up to robust, flavoursome southern Italian food. At £9 a bottle it’s a reasonable price, but I picked it up from Waitrose online as part of a mixed offer with 25% off, making it closer to £6.50, at which point it’s a great deal.